Colleague’s preamble gave us ambivalent feelings. There were those hated words ‘clashes’ and ‘jumbles’ but then a rather more promising indication that we were going to be given definitions of the eight-letter jumbles that we were to remove from across clues, and that they were also going to have eight letters. I scanned to clues to check that Colleague was reserving his place in the Listener Setters’ Boozy Club and he barely qualified with only ‘wine cases’ appearing in a late clue (Fabric used for [overcoat] and wine cases (5) BIN + CA). However, I did notice a rather familiar exhortation to “Stand on two legs” which, together with the presence of a bull, broods, and an evictee in the preamble, together with a thematic place, which had a temporary replacement, roused suspicions, which were speedily confirmed, that this was about an all-time favourite of mine. BANJO and NEST EGGS gave us JONES on the first row and we looked symmetrically, and, sure enough, found SALLY MAN and ORALS giving us MANOR (to put in front of FARM) ‘He (Napoleon) had only one criticism, he said, to make of Mr Pilkington’s excellent and neighbourly speech. 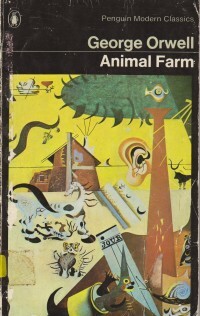 Mr Pilkington had referred throughout to ‘Animal Farm’. He could not of course know – for he, Napoleon, was only now for the first time announcing it – that the name ‘Animal Farm’ had been abolished. Henceforward the farm was to be known as the ‘Manor Farm’ – which, he believed, was its correct and original name.’ Thus, Colleague’s title, Rise and Fall. Solving from that point on was sheer fun. We knew what we were looking for and BLUEBELL, SNOWBALL, SQUEALER, NAPOLEON and our favourite BENJAMIN soon emerged from the clues. Finding their definitions was not so easy, as we were not aware that a NAPOLEON was an ICED CAKE but we eventually got there by a process of elimination when the others were defined as HYACINTH, VIBURNUM, INFORMER and OVERCOAT. The clashes were appearing in typical Numpty fashion, as I was putting likely Animal Farm Names in fast and furiously (MAJOR, MOLLIE, JESSIE, BOXER, MINIMUS, MOSES, CLOVER, MURIEL, PINCHER and having to work backwards to find what the clashing word could possibly be (MAROR, MILLIE of ‘Thoroughly Modern’ fame, NESSIE, BORER, MINIMUM, MESES, CLAVER, ZURIEL and … did I say PINCHER? Well, the other two dogs were there weren’t they. Surely he had to be? There is always a Numpty red herring and this had to be it. We fiddled for ages attempting to have a HELMETS/PELMETS clash and to bring PINCHER into the grid but it was not to be. (I fiddled around, though and found that, with a few very obscure words, he could have been there!) I wonder whether Colleague originally had him there and was prompted by the editors that with his other obscure proper nouns ZURIEL, JAMESON and DUHEM, he was already pushing the limits. We couldn’t complain anyway. What a wealth of material he did manage to include in the grid. 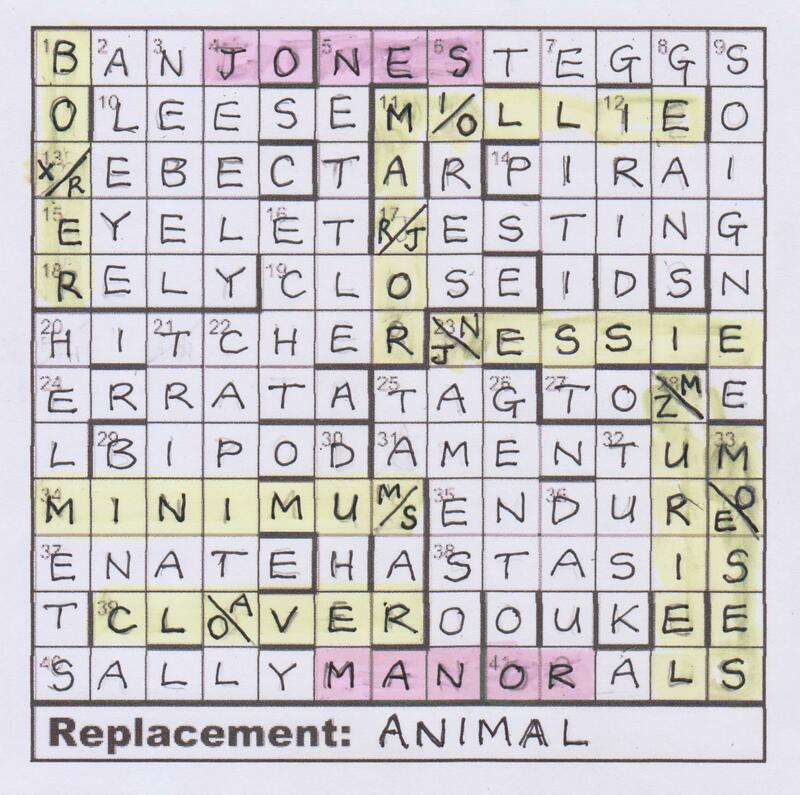 We erased Jones (after all, he did die in an inebriates’ home didn’t he!) highlighted MANOR and mentally thanked Colleague for a couple of hours of sheer pleasure. This entry was posted on 7 February 2014 at 5:00 pm	and is filed under Solving Blogs. Tagged: Colleague, Rise and Fall. You can follow any responses to this entry through the RSS 2.0 feed. You can leave a response, or trackback from your own site.